From the kindly gentleman Arthur Frommer to the anything but Anthony Bourdain, I had a rollercoaster of a travel and food night Friday night. I’d love to have the life of either of these giants for a day. As close as I’ll get was the fabulous opportunity to interview Mr. Frommer and a media pass to take in Bourdain’s presentation at the Idea Festival. 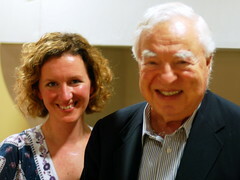 I only found a couple days ahead of Mr. Frommer’s appearance at a travel show in Louisville that he’d be here – I shot off a request for an interview, not hopeful, but it never hurts to ask! To my extreme delight I was granted a meeting with him. I was as nervous as a little kid going to see Santa Claus about talking with him. Brian and I met him briefly a few years ago at the New York Times Travel Show and I remembered him as a lovely gentleman. But now I’d be sitting at a table talking with him! Brian accompanied me, ostensibly to take photos, but really because I wanted him to have the chance to talk with him as well. Mr. Frommer considerately arrived in the lobby of his hotel a few minutes before our appointed time, beaming as if there were nothing he’d rather do than talk with some writer in Louisville. Though I was still nervous and excited, he put me as at ease as possible, handing me a copy of his new book Ask Arthur Frommer and talking nearly non-stop as we walked to the hotel café. I wanted to giggle as we were seated – if only the waitress knew who he was! Though I had a list of questions they largely went unasked, as he told story after story. I would have loved nothing more than to sit all night listening to his tales, smiling at his enthusiasm for the HP Netbook, Skype for iPhones, and China. Though I could never quite forget I was talking with the patriarch of travel writing, I was able to relax enough to thoroughly enjoy the occasion. He gave me his personal email address (an AOL account, which just added to his grandfatherly charm) and his daughter, travel writer Pauline Frommer’s, telephone number so that I could ask her about travel with kids. I smiled ear to ear all the way downtown to see Bourdain’s show after our meeting. It was a great honor to spend an hour with him, and I’ll not forget it. Next up, my great love after travel – food. Anthony Bourdain was in town to talk about what makes a culture of good food. I scored press passes for the event for my Louisville.com story, and arrived with conflicting feelings. (As I type this on my flight to NYC he’s sitting five rows ahead of me which amuses me to no end). The man has my dream job – to travel the world and eat. I enjoy his writing and find him comedic but despair at his needlessly over-the-top hating on vegetarians. He seems to respect people of other cultures in every country he visits, but those of us who, for whatever reason, don’t eat meat here in his own country, he disparages at every possible moment. In the event though I was wildly entertained by his monologue, and finally got to hear his reasons for the anti-veg stance. Imagine you show up in a remote village in Asia and they kill the only duck they have for you. Are you going to decline it? Though he has firm ideas of what’s a pet and what’s food, he claimed that if he were offered puppies his answer would be “bring on the puppy heads.” Moreover, he compared traveling as a vegetarian to going to the Louvre and refusing to look at any art that’s not red. Duly noted, Tony. It occurred to me he’d likely be on my flight to New York, as I was on the only non-stop flight the next day. Brian had the brilliant idea that I print two copies of my story—one to give him and one to have him sign. And sure enough, as I stepped away from the Continental check-in desk, in strode Anthony himself. My heart fluttered like a teenager. “Great show last night!” I said. He forced a smile. Clearly talking to the locals in middle America, no camera in tow, was not his thing. I babbled something (why *do* we act like we lose 20 IQ points when talking to a celebrity?) and gave him a copy of the story plus one to sign. He asked my name, scrawled on it, and I left him to his business, noting that for someone that claims to have quit smoking, he certainly smelled of cigarettes. I strategically stopped before security to fiddle with my belongings in order to place myself ahead of him in line. He was more receptive of the security staff’s shouts of “Anthony!” than he was of our little encounter. I settled myself at my gate in a spot where I’d be sure to see him, and debated whether to approach him for a second time. If he weren’t famous I’d be all about talking to him — swapping food and travel stories is just about my favorite thing to do. I felt like an 8th grader asking a boy to dance when I finally gathered my resolve enough to walk over to him and ask if it was too early for a drink. For the record, the Anthony Bourdain on No Reservations and in his books would never feel it was too early for a drink. And with a camera man behind him he’d leap at the chance to get cozy with a local. But not today in the airport with this average white girl from Kentucky. He at least smiled when he said ‘no thanks,’ leaving me to slink off embarrassed, but glad I’d had the nerve to do it. All in all I much preferred the company of Arthur Frommer. ← See Dana. See Dana in France. What fantastic entry! I admire your chutzpah for asking Bourdain for a drink. And Frommer sounds like an absolute delight. I’ve enjoyed your NYC tweets. What took you to the Big Apple? Thanks! 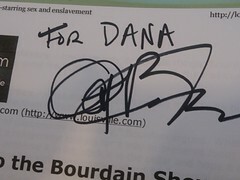 I knew I’d regret not asking Bourdain if I didn’t at least try.